I have been learning and practising various forms of healing for the last 10 years. 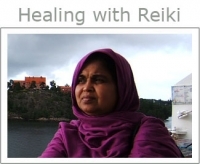 I seem to be drawn to people who need healing or who want to learn reiki. Thus, I have learned to live and work from the heart, adapting myself spontaneously to all walks of people.No two people are the same, and my Healing is guided by each person’s individual needs. I was awarded "Best Reiki Therapist 2018" by Global Health & Pharma; and "Best Reiki Master/Teacher 2018 by LUX magazine. I am a Reiki Master and Teacher, i.e. I give treatments, and also teach Reiki. I am professionally insured and offer Certificates at the end of each Reiki level. I offer a variety of Reiki therapies and each treatment is tailor-made to suit each individual’s requirements. I have also worked on a voluntary basis for Harrow Age Concern for a number of years, as well as treating private patients. I practice in a GP surgery and also at The Haven Therapy centre and also and Euro Hotel in Harrow. I have also taught Reiki around South America and in Scandinavian countries. For further information please email me at healingtheplanet@hotmail.co.uk, or visit www.positivehealingtherapy.com.